In geometry, a rhombus (from Ancient Greek ῥόμβος - rrhombos, “rhombus, spinning top”), (plural rhombi or rhombuses) or rhomb (plural rhombs) is an equilateral quadrilateral. In other words, it is a four-sided polygon in which every side has the same length. The rhombus is often casually called a diamond, after the diamonds suit in playing cards, or a lozenge, because those shapes are rhombi (though not all rhombi are actually diamonds or lozenges). In any rhombus, opposite sides are parallel. Thus, the rhombus is a special case of the parallelogram. One analogy holds that the rhombus is to the parallelogram as the square is to the rectangle. A rhombus is also a special case of a kite (a quadrilateral with two distinct pairs of adjacent sides of equal lengths). The opposite sides of a kite are not parallel unless the kite is also a rhombus. where a is the length of the side and θ is the angle between two sides. One of the five 2D lattice types is the rhombic lattice, also called centered rectangular lattice. since the norms of AB and BC are equal and since the inner product is bilinear and symmetric. The inner product of the diagonals is zero if and only if they are perpendicular. The word rhombus is from the Greek word for something that spins. Euclid used ρόμβος (rhombos), from the verb ρέμβω (rhembo), meaning "to turn round and round" . 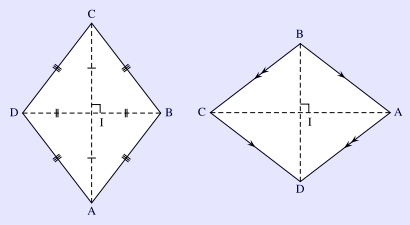 Archimedes used the term "solid rhombus" for two right circular cones sharing a common base. * Rhombus definition. Math Open Reference With interactive applet. * Rhombus area. Math Open Reference Shows three different ways to compute the area of a rhombus, with interactive applet.